Got (or Will Have) Grandchildren? Want to Help Secure Their Financial Future? Don’t you just love being a grandparent? Is there anything more fun than spending time with the little one? Playing with them, reading to them, helping give them a bath, it doesn’t matter — whatever you do together, it’s just the best. Making sure your grandchild has financial security. Buy a life insurance policy for your grandchild. To be clear, this has nothing to do with a death benefit. Rather, it’s about using the power of compound interest and time, within the tax-advantaged environment of a life insurance contract, to build real wealth. For the best results, you need to purchase a whole life, cash value policy from one of the handful of elite carriers in the marketplace. These companies are financially solid, consistently out-perform the also-rans, and have long track-records that prove their mettle through good times and bad — a few were in business before Abraham Lincoln was president. But before we go further, let’s take a moment to explain how whole life policies work. It’s just over 100 words. I know you can do it without your eyes glazing over. Ready… GO! 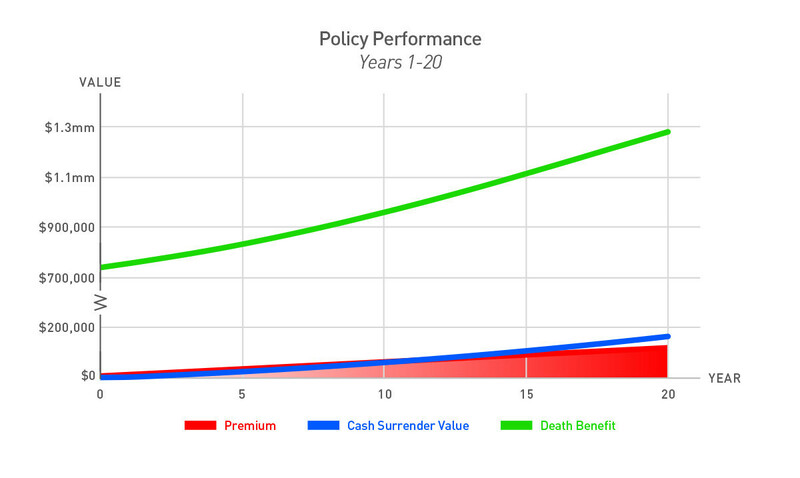 A whole life policy has two components, the Death Benefit and the Cash Surrender Value. The Death Benefit (DB) is paid when the insured dies; it’s received income tax-free. The Cash Surrender Value (CSV) can be seen as a “savings account ” built into the policy. It builds up through the policy’s guaranteed interest rate and dividends paid by the company. The policy owner controls the CSV. The owner can borrow tax-free from the CSV, or surrender the policy and receive the CSV amount. CSV is guaranteed to increase, it is not taxed while growing, and it cannot go down once posted (unless borrowed against or surrendered). So, did that make sense? Don’t just nod along because you don’t want to seem dense. Most people have no idea how whole life works; these are new, and confusing, concepts, so make sure sure you understand. He or she gets life insurance at the youngest age and best health possible, meaning premiums are the lowest they can possibly be. There’s no medical exam; a parent answers a few simple questions. Juvenile applications are often approved in days, rather than weeks or months for adults. The clock gets started as early as possible on the non-taxed growth of the Cash Surrender Value. Growing CSV can create an increasing Death Benefit. Given multiple decades to compound, with no taxes being siphoned off, CSV’s and DB’s can skyrocket. Once it’s issued, the policy can never be taken away or re-priced. A later-in-life health problem that might make a new policy more expensive, or even unattainable, doesn’t matter because your grandchild’s policy is already locked. The policy makes a wonderful wedding gift. Your grandchild doesn’t know it exists. Imagine the bride or groom’s surprise, and joy, on discovering his or her new spouse is protected, and there’s significant CSV to help them get started. If your grandchild’s marriage ends, the policy is separate property, rendering it divorce-proof. CSV can be accessed to help pay college tuition, whether for your grandchild or eventual great-grandchildren. And, unlike a 529 college savings plan, CSV does not count against the family for financial aid at the vast majority of institutions. When your grandchild reaches a retirement age, he or she can take tax-free loans from the CSV, creating a personal pension plan. These loans never need to be repaid (though the DB may be reduced). When your grandchild dies, 80, 90, 100 years from now, the policy will pay a tremendous tax-free DB to the people he or she loves. Family members you will never meet will know they’re benefiting from your actions a century earlier. So what does it cost, and how much does it produce? Let’s look at a policy for a newborn boy, with a $500 monthly premium ($6000 per year). These premiums are payable for 20 years, meaning a total of $120,000 goes into the policy. These are the actual numbers provided by one of the companies named above, based on the interest and dividend it is currently paying (the dividend amount is not guaranteed, but has been paid consistently since the 1860’s). The Death Benefit, in green, starts a bit above $700,000, and by year twenty has grown to just under $1.3 million. Cash Surrender Value, in blue, has grown to about $165,000 after twenty years. And the total premium paid in is $120,000 (in red). So after twenty years, $120K has gone in, producing a CSV of $165K. It’s a positive return, but minimal. Remember, though, this is a long term play. And no more premiums are due — not another penny goes into this policy. Guaranteed. Now let’s look at the policy over what may be the grandchild’s life span, 100 years. See that little bit of red in the bottom left? That’s the total amount of premium paid in. Ever. 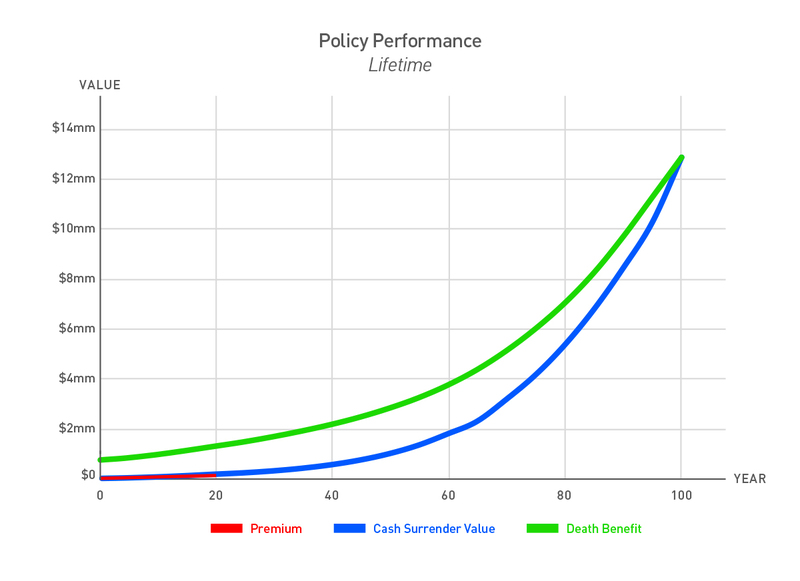 See the blue Cash Surrender Value and green Death Benefit? Do you like the direction they take later in your grandchild’s life? Check out the Death Benefit at age 30, when that boy may be starting a family and wants to be sure his wife and kids are protected, just in case. Look at the Cash Surrender Value at age 50, when he may need some help sending those kids to college. Take in the CSV that will be available at age 80, when a health expense like long term care may crop up. And if that boy dies at age 95, he will leave his loved ones over $11,000,000. That’s more than 90 times the amount paid into the policy. The $500 per month figure is just used as an example; whether you put in more or you put in less, the results will be proportional. And if you don’t want to be committed to 20 years of premiums, some of the top companies offer policies that can be fully paid in ten. This is not to suggest that life insurance be the only financial vehicle that’s employed for that grandchild’s benefit. Diversification is a fundamental part of good financial planning. But because of its tax-advantaged nature, and the tremendous leverage a policy generates, whole life insurance is certainly worth considering. It’s a powerful way to help ensure the financial future of your grandchild, as well as future generations of your family. This entry was posted in Family & Friends, Financial & Legal and tagged featured, financial planning, grandchildren, life insurance, security. Bookmark the permalink.